If you didn't nab one of the special editions of Fallout 4 during its very small release window, then you may well be finding yourself without one of your very own. Unfortunately, it looks like the Fallout 4 Pip-Boy Edition will simply no longer be made for the foreseeable future. According to GameSpot, Bethesda's VP of Marketing Pete Hines told the publication that the studio had, in fact, hit its factory limit on production of the units. What's that mean? There were entirely too many of us who wanted to get our hands on the set, and too quickly. The collector's edition sold like hotcakes, and retailers haven't been able to stock up again for weeks. It's been very frustrating for those who weren't able to pony up the $120 immediately upon its announcement, and now it looks like they're just never going to be made available again. "They're being made today, it's not like they're done and sitting in a warehouse. [The factories would tell us,] this is what the yields say. I mean, we don't make [the Pip-Boy Editions], and we'd go back to [the factories] and say, 'Demand for this is insane, we've got to make more.' And they'd move other projects off or shift stuff to other factories and it just came to [them telling Bethesda], 'Final answer: sorry, this is as many as we can make.' And we sold every single one of those that we could." He also said that there were so many Pip-Boy Editions ordered that the amount of preorders made for this limited edition ended up totaling more than any other Bethesda set in the past. Ever. 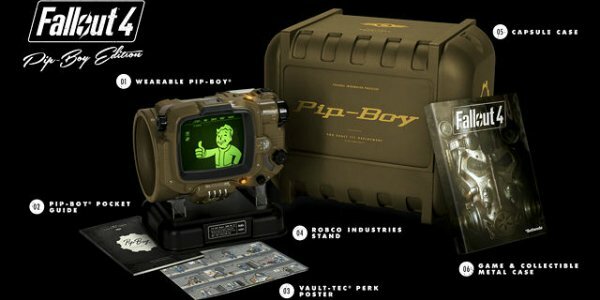 It's not surprising, given the fact that the set comes with a special replica Pip-Boy device that can hold your smartphone, a poster, special game case, the game, and other goodies. It's a Fallout fan's dream. And now it's sold out. You may still be able to hit up eBay or snipe it from someone who doesn't pick up their preorder, but it looks like that's all she wrote for now. Fallout 4 is marching toward a November 10 release for Xbox One, PlayStation 4, and PC. And if you were one of the lucky ones who snagged a Pip-Boy Edition, revel in the fact that this is one collector's edition that's actually going to be scarce...unlike some we know. Halo, anyone?